Justin's WeatherTalk: Coldest Winter in 7 years. Once Again, I'm Torn! It's Official: This winter has been cold! I have pointed out the record snow and cold for most of the nation, while we have had a somewhat uneventful winter. Now NOAA has officially stated that this winter (Dec., Jan, and Feb.) has been the coldest for the globe since 2001. That bucks the trend! While some might give full credit to the La Nina (cooler Pacific Ocean Pattern)- this does date back to the southern Hemisphere winter last year- before the La Nina took hold. For more on this report- click here or the image at the left. Next: The round of low pressures ready to hit us over the weekend. It's likely they surround Saturday with morning and evening rain- but dry most of the day as one departs and the second arrives. It's the second and stronger low that has me on the fence. How many times this winter have I mentioned a storm that could "end as snow". The models have shown the cold air wrapping in just as the moisture departs. Here we go again. This time a difference is seen between models. 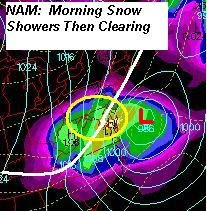 I have here an example showing the snow in the NAM/WRF model which looks impressive for Saturday night into Sunday morning. 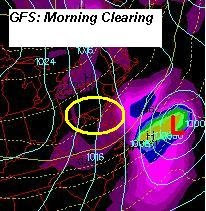 The UKMET also shows at least some flurries possible on Sunday morning. While the GFS model- which lines up with the NGM and Canadian show the system racing out of here by early Sunday with all of the moisture locked too far away.